Large selection of premium designs. The Chinese New Year is an important Chinese festival celebrated by Chinese worldwide. Based on the lunisolar calendar, the Chinese New Year marks a new year and a new beginning. As the first day of the Chinese New Year (CNY) typically falls on a day between 21st January to 20th February, during Spring, the CNY is also known as the Spring Festival. There are many different customs/traditions practised by Chinese all over the world. In Singapore, the giving of Chinese New Year Red Packet (also know as Red Envelope, Ang Bao, Ang Poo, Lisi, 利是封, 红包, 红包封) is a well-observed custom at Chinese New Year. Red packets are red envelopes with money inside given by parents to kids, by the elderly to the grandchildren and by married adults to kids. It symbolises blessings to the receivers. 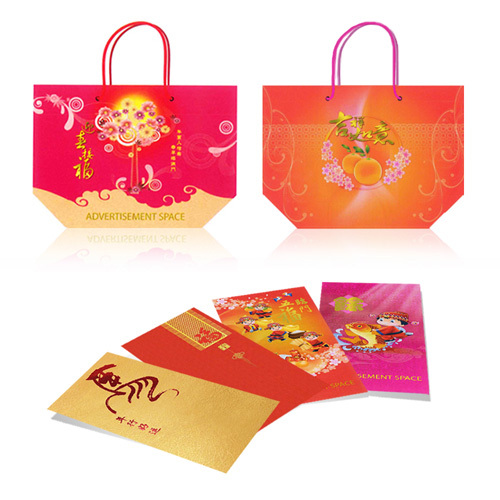 Traditionally red packets are only in the colour red but today, it comes in many different colours such as gold, yellow and pink. Today, red packets are not only used during the Chinese New Year. They are also used during weddings, baby showers, birthdays and other occassions when the sender wishes to send his blessings and well-wishes to the receivers. They normally have auspicious Chinese characters and pictures on them that mean Prosperity, Fortune and/or Good Luck. It is also common for bosses to give their employees’ bonuses and well-wishes during the CNY to thank them for their hard work for the year. As a marketing tool, companies are also giving out free red packets to their customers before the CNY to thank their customers for their support throughout the year(s). These red packets do not contain money and typically carry the company’s logo and other details (eg. website and contact numbers). They are given as a gift to the customers and when customers use them by putting money inside and giving them out to their employees, kids and relatives, it achieve the effect of spreading their company’s brand. Red packets are often given out in packs of 8pcs or 10pcs. It is also customary for families to visit each other’s house during the CNY. The visiting family bring along even number of oranges (more accurately Mandarin Oranges or Tangerines) and convey New Year greetings which will be reciprocated with the return on similar amount of oranges. This exchange of oranges signifies the well wishes and exchange of luck & wealth. Every year, we offer a great variety of premium designs and materials for customers to choose from. Customers are able to hotstamp their company info (eg. Logo, website, contact numbers) on the front, back and/or flap of the red packets. This is suitable for companies or individuals who want a unique design and/or material. We have the capability to produce really specialised design. Feel free to browse through our catalog by clicking on the above link or contact us to discuss your customisation needs!